Give the gift of beautiful flowers year-round! With our Flower of the Month Club, you'll receive a gorgeous potted plant each month - ready to decorate your home or transplant into the garden. Our Bulb Garden of the Month Club includes the delivery of a ready-to-grow bulb garden, packed in a carefully-selected designer planter, every month. Both subscriptions are available for three, six or twelve months. 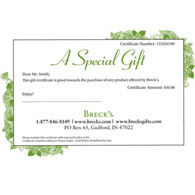 Breck's flower clubs are the ultimate gift for the gardener in your life!